The tree ring readings of the Finnish foresters are predicting a large decline in temperature bottoming out in about 2045. The downturn you see on the right hand side of the graph is larger than any other in the last 500 years. A cold period longer and deeper than any other in the last 500 years would have lots of real world consequences. That would be worth following up on, wouldn’t it? 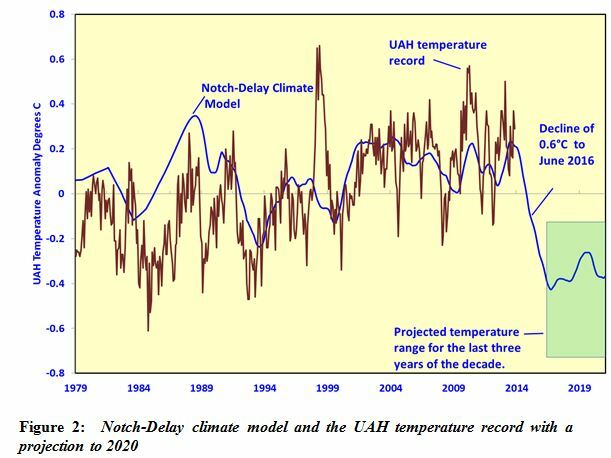 The figure above shows the model output plotted against the UAH temperature record. It shows a very steep decline, starting in late 2014 and ending in June 2016. After that it trends sideways for the rest of the decade. The green box shows the expected temperature range in this period. The predicted decline to mid-2016 is 0.6°C. That is not remarkable in itself. There are a few declines of that magnitude in the 34 years of the satellite record. The remarkable thing will be that the temperature will not bounce back. 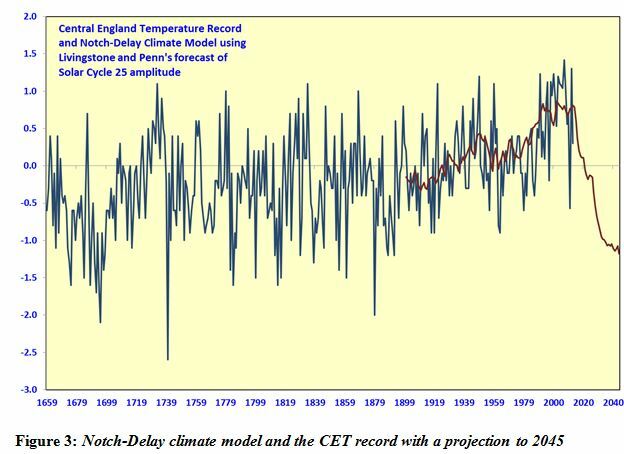 The figure above plots the notch-delay model output against the Central England Temperature (CET) record. The hindcast match is good. The interesting thing is that the projected temperature decline of 3.0°C is within the historic range of the CET record. The low is reached about 2045, lining up with the projection from the Finnish tree ring study. 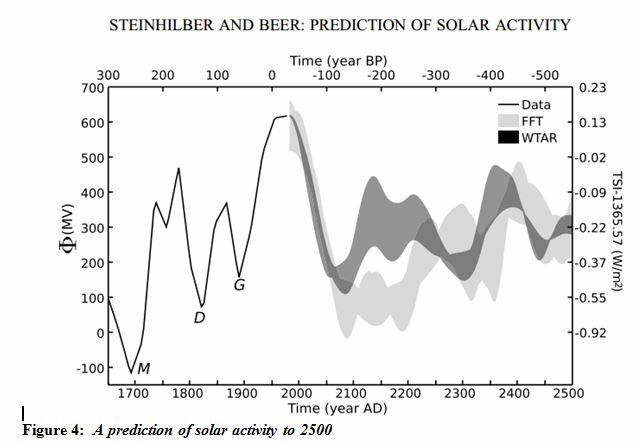 Maunder and Dalton Minimum-like levels of solar activity will be associated with temperature levels similar to those recorded during these minima. There is nothing remarkable about that observation but it seems to be needed to be said. Let’s go on to consider some of the real world impacts of the temperature decline coming. The big one is the reduction in agricultural production in prospect. Back in 1980, Newman determined that each 1.0°C change in annual average temperature moved the Corn Belt 144 km. The Midwest gets more polar amplification than the CET record so the temperature decline in prospect is larger at 4.4°C. 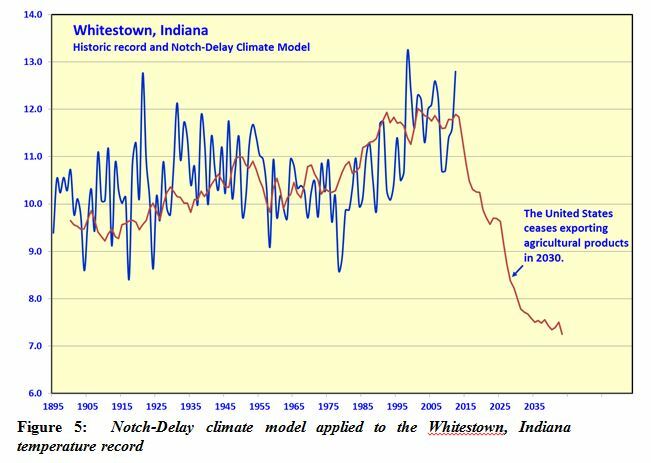 From the Corn Belt, this is the prediction for Whitestown, Indiana. Productivity is directly proportional to temperature in the mid-latitudes. For the Corn Belt it is 10% per 1.0°C of average annual temperature. Corn requires temperatures above 10°C, wheat above 4°C. Where it is too cold to get a corn crop off in a season, wheat is grown. Where too cold for wheat, rye and oats are possible. As growing conditions move south, some formerly productive land will be abandoned. Regions in the south in which the length of the growing season allows double cropping will be reduced to one crop per season. Wheat production could go up by a switch from hard summer wheat to winter wheat which has a lower protein content and makes lower quality bread. Production will respond to higher prices – several farmers from the Midwest have told me that they could have a big increase in production with the right price signal. Large areas of land in the southeast and northeast US that are currently non-competitive with the Corn Belt could be brought into production with the right price signal. Also with the right price signal, a lot of food could be grown residentially. During WW2, 40% of US vegetable production was from domestic plots. The appropriate high protein plant crop is soybeans which are 12% protein in the green bean. You can grow potatoes easily enough but they are only 2% protein. All things considered, the production decline for US agriculture could be 8% per 1°C. A fall of 3°C and the United States would be out of export markets for agricultural products, with the same true of most mid-latitude grain exporters. 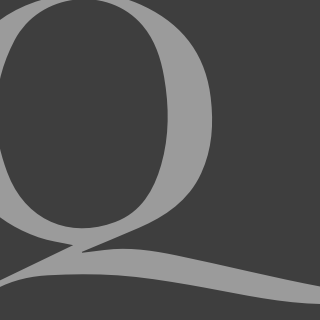 This will have profound geopolitical implications – namely, starvation and collapse for countries that import food. That’s for next decade. This decade, once the temperature decline is widely apparent, currently importing countries around the world will rush to stockpile, bringing forward the price effect of scarcity. If this sounds like the reverse echo of the global warming crowd, how often have leftist wealth-redistributors been right about anything? Given their track record, the exact opposite is the more likely outcome. We should be ever thankful to them though. If it wasn’t for their melodramatic predictions attracting honest scientists into the climate science field, humanity would be sleepwalking into the climatic and agricultural disruption that is coming. We will still have the consequent famine and death but we will know what’s causing it at the time. We are on the edge of that abyss. A vale of tears awaits. Good luck to all of good heart. P.S. Cold-driven famines over the last few hundred years are well documented. Severe cold in the 1690s killed 30% of the population of Finland, and lesser percentages of other countries from France to Sweden. In Ireland, 20% of the population died in 1740, one hundred years before the more famous potato famine. In 1816, the Swiss were eating their cats, dogs, rats and horses.